Ohio's attorney general is investigating the role that credit-rating agencies like Moody's played in rubberstamping dicey bonds, report Fortune's Katie Benner and Adam Lashinsky. (Fortune Magazine) -- While Bear Stearns is the most recent financial institution to find itself caught up in the subprime-mortgage quagmire, the three credit-rating agencies - Standard & Poor's, Moody's (Charts), and Fitch - may be the next ones to see their good names dragged through the mud. The reason? 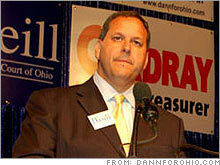 Ohio attorney general Marc Dann is building a case against them based on the role he believes their ratings played in the marketing of risky mortgage-related securities. "The ratings agencies cashed a check every time one of these subprime pools was created and an offering was made," Dann told Fortune, referring to the way the bond issuers paid to get their asset-backed securities (ABSs) and collateralized debt obligations (CDOs) rated by the agencies. These ratings run from AAA for debt with the lowest risk of default all the way down to noninvestment- grade bonds, which many pension funds are prohibited from purchasing in their charters. "[The agencies] continued to rate these things AAA . [So they are] among the people who aided and abetted this continuing fraud," adds Dann. Ohio has the third-largest group of public pensions in the United States, and they've got exposure: The Ohio Police & Fire Pension Fund has nearly 7 percent of its portfolio in mortgage- and asset-backed obligations. Dann and a growing legion of critics contend that the agencies dropped the ball by issuing investment-grade ratings on securities backed by subprime mortgages they should have known were shaky. To his mind, the seemingly cozy relationship between ratings agencies and investment banks like Bear Stearns only heightens the appearance of impropriety. In addition to receiving fees from bond issuers that want ratings, S&P, Moody's, and Fitch do not vet data provided by these customers - information the agencies use to make their credit assessments. It's a bit like a take-home final. Or as Moody's puts it in its own code of conduct, "Moody's has no obligation to perform, and does not perform, due diligence." The other two agencies have similar provisions. Moody's and its cohorts might have some wiggle room. "The agencies are on fairly strong ground that their ratings are just opinions, but that doesn't absolve them from liability risk," says Steve Thel, a securities law professor at Fordham University. Dann contends also that the ratings are used as benchmarks by institutional investors. He is not alone in this assessment. According to experts in structured finance valuations, the ratings agencies are the central drivers, particularly in the riskier areas of asset-backed securities markets. The pool of buyers would be much smaller without a rating because pension and mutual funds hold only investment-grade bonds, says Christopher Whalen, who sold asset-backed securities at Bear Stearns and is now a principal at Institutional Risk Analytics, which provides tools to credit officers to assess bonds. "The rating drives everything," adds Sylvain Raynes, a former Moody's analyst and currently a principal at R&R Consulting, a firm that examines these securities. Others point out that CDOs are too complex for even sophisticated investors to parse, so the ratings take on great importance. "It is unreasonable to think that people could do the quantum math to figure out the ultimate aggregate default rate on a CDO. So, yes, there is a greater expectation that the gatekeepers will scrutinize the underlying credit," says Doug Cifu, a partner who specializes in private equity and finance at Paul Weiss Rifkind Wharton & Garrison. Regardless of whether a lawsuit materializes, the ratings agencies already seem to be policing themselves. Of the pool of securities created from 2006 subprime mortgages, Moody's has downgraded 19 percent of the issues they've rated and put 30 percent on a watch list. Sadly for Wall Street, if the ratings agencies feel the need to downgrade even more, it will certainly constrict the cheap debt that has fueled the bull market. Or as Whalen puts it, "The Street dragged everyone into increasingly bizarre and illiquid instruments, and there was huge profitability there, but what it did was buy itself a lot of trouble."